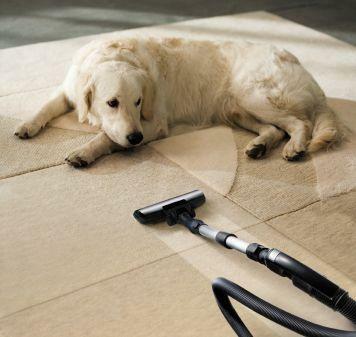 As you make plans for spring cleaning, keep your dog's health and safety in mind. This tip from Wendy Nan Rees will get you off to a great start using natural cleaners like white vinegar, lemon juice, salt, and baking soda. With spring just around the corner, many of us are just counting the seconds until we can open up all our windows and doors to let fresh air inside our homes. We're ready to let our dogs out to run and get all the pent up winter blues and a few extra pounds off of them. As we talked about previously, finding a new fun sport to do with your dog that involves both mental and psychical stimulation is by far the very best way to help your dog stop any destructive behavior he may have picked up during the long winter months just sitting inside. It's also a great time to think about spring cleaning once your dog is able to spend more time outside. The great news is that nature has, yet again, provided us with the most wonderful antibacterial properties. They are inexpensive, and the fun part is that we can use scents we like and not just what the chemical companies want us to use. The problem with buying supermarket cleaning products is that the fumes they give off are not always the best for you or your dog. Yes, today they do offer many nice "green" cleaning products, but to me they seem to be on the expensive side. With that being said, I like to make my own cleaners. I also love to give them as housewarming gifts, or sometimes I just bring them when I get invited to a beach party or an outdoor BBQ. I like to see my friends reaction to it. They always say "This is too cool!" Tee tree oil - Make sure you get the real tea tree oil made in Australia. It is well documented that this oil has been used for many years as a natural remedy to help repel fleas, as a disinfectant, and for its antifungal and antibacterial properties. All of this from one great smelling oil! Some people do not like the scent. Personally, I love it. Lavender Oil - Again, it is important to get only the real deal here. This oil has wonderful healing and soothing properties. Many people say it helps as a natural anti-depressant. You can also make this a nice gift by making enough and then placing it in a dark glass (must be glass) bottle. Tie a bow with raffia and attach a tag with directions on how to use it, and you have a nice little cleaning gift. I use this scrub to clean anywhere when the boys have tracked mud in, or by the food bowls and by the water bowls. I use it to clean the bathroom. I use it everywhere. It smells great, and it really gets things clean. I use about 1 cup of regular salt and then add ½ cup of kosher salt. Next, I add just about ¾ tablespoon of baking soda. That is all you combine for the gift part. The rest needs to be added depending on what will be cleaned. Adding fresh lemon juice will whiten things and make them smell great. If you want to add tea tree oil, this cleaner will also disinfect. Another green cleaning tip is to add 1 cup of lemon juice when the washing machine is on the rinse cycle. Don't use fabric softener; add lemon juice. It will not only brighten the laundry, but it will give a wonderful fresh clean scent to your dog's bedding, blankets and doggie T-shirts. The best all-around strong cleaner is my vinegar and lemon cleaner. You can use the vinegar all by its self, but I just happen to like the scent the lemons add. This works great to clean out smelly dog crates, and it also works well on glass and anything that has a shiny finish. It may take a few hours to get the full effect, but I promise you it works. It even cleans the lime buildup from my most beloved kettle. I fill it with white distilled vinegar and lemon juice and bring it to a boil. I let it sit for ten minutes and then rinse well. Add fresh water and bring that to another boil. To my delight, I have a new kettle again. If your dogs have the nasty habit of drinking out of the toilet which we will talk about another day, you sure don't want to put chemicals in there. I put in 3 cups of white distilled vinegar and close the top. I leave it for three to four hours and then come back with a toilet brush. I scrub, and it becomes sparkling clean. If I really want to add a great smell to my bathroom, I will add a few drops of whatever oil I have around the house and swish that around. The bowl then smells so fresh and clean. I hope these few fun tips have inspired you to save a few pennies and have a bit of fun cleaning off old man winter and bringing in spring with Fido by your side. A few small changes like these can help keep your home green and your dogs and kids safe.